Aside from being a great way to learn about climbing and to meet climbers, joining the New Zealand Alpine Club also allows you to compete in the Club’s annual photographic competitions, both national and regional, plus enter the annual Federated Mountain Clubs (FMC) photographic competition. This is a good way to get peer feedback about your mountain images. I enjoyed occasional success at these competitions, culminating in the national overall NZAC winner award in 2014. Since then I became a judge at the Wellington Regional competition for four years and am now the judge of the annual FMC competition. 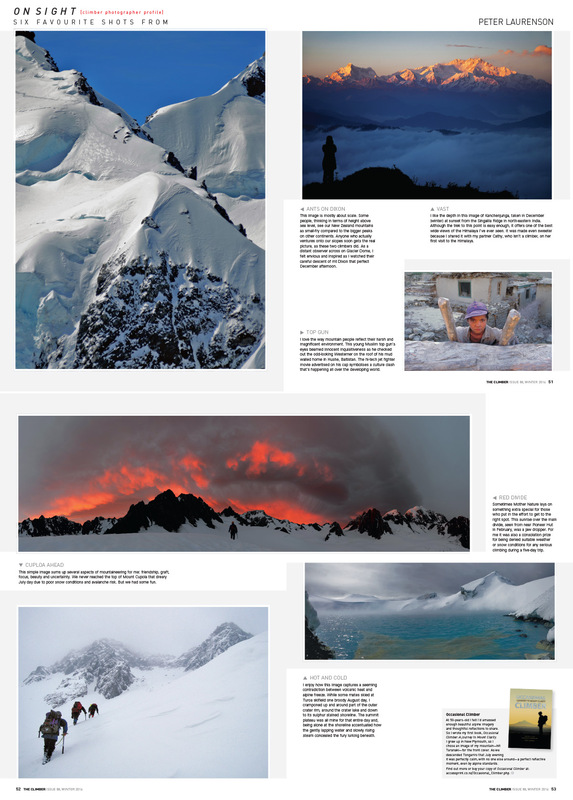 As a source of creative stimulation and a way to get wider peer feedback on my own favourite images, I’ve also established Occasional Climber portfolio pages on National Geographic Your Shot and ViewBug. Above are my occasional winners across these four forums.